With Hour of Code and CSEdWeek in full motion, you may be looking for more content to do with your class or are just starting and are not sure where to begin. This guide will help you have a successful Hour of Code in just 3 steps. So how do you get the most out of all the courses offered during Hour of Code? First, decide what level your class is at, then utilize available teacher resources and lastly, celebrate your class’ achievements! Once you have decided which level your class it at, click either button to then sort through activity that your students can do. 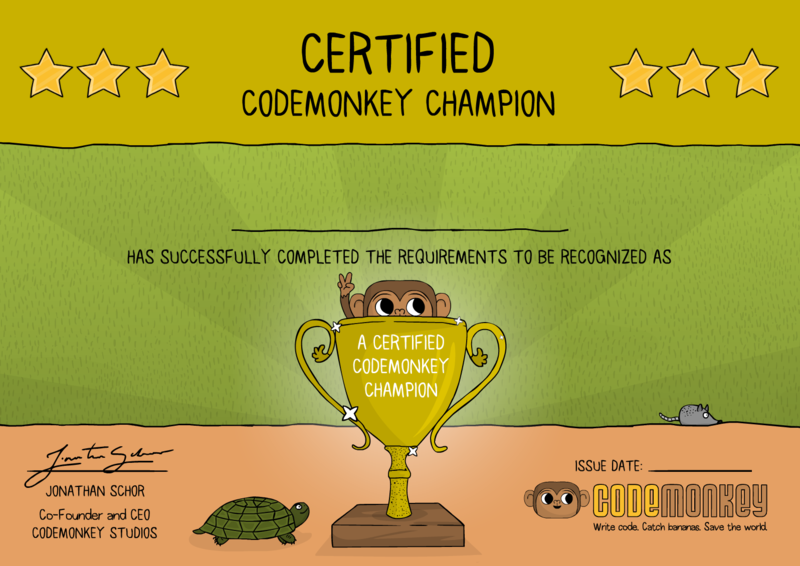 For beginners, CodeMonkey recommends its Coding Adventure activity where students need to help a monkey catch bananas and is ideal for 2nd to 6th graders. Students do not need any experience or introduction to coding to enjoy this text-based coding game. For those who are either comfortable with coding or completed the Coding Adventure activity, they can continue the fun with Dodo Does Math. This course combines math and coding principles to help 2nd-4th graders practice distance, measuring and multiplication by helping a Dodo catch her eggs. For those who have learned how to code and completed all 200 challenges in Coding Adventure, we recommend Game Builder, an interactive game design course for grades 5-9. For Middle School and High School teachers, we recommend CodeMonkey’s newest and more advanced courses – Trivia Chatbot and Moon Lander for grades 7-10. In Trivia Chatbot, students will program a chatbot in Python. In Moon Lander, students will incorporate game design principles to safely land a spaceship on the moon using physics and coding principles. These are recommended grades; older students can also enjoy Coding Adventure. There are a few tips you should always keep in mind when hosting an hour (or hours) of code. 1. Save student progress: Since code.org does not require students to log-in, their progress does not get saved. 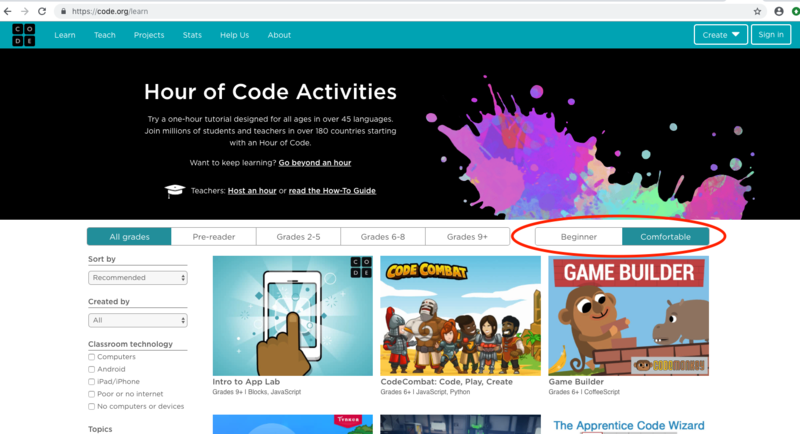 If you are planning to continue Hour of Code with your students or want them to complete their courses on their own, be sure to log-in to the program you are using. 3. Plan Technological Needs: You can bring your class to the computer lab for one period so students can do Hour of Code together. If you classroom already has ChromeBooks, I-pads, or laptop carts, your students can take turns doing Hour of Code throughout the week. Don’t worry, you don’t need a computer for every student. Working in pairs requires fewer devices and students can collaborate to learn more and help each other out. 4. Check Internet: Make sure you have an active Internet connection ahead of time since all activities are web-based. 5. Refer to Teacher Notes: Most activities have teacher notes that will provide you with solutions to harder challenges, course outline and hints and tips. Introducing your students to computer science is a crucial step in paving their path to a bright future. During and after CSEdWeek, you should acknowledge your students’ efforts through sharing your classes’ Hour of Code journey and photos on social media with #HourOfCode #PlayCodeMonkey. Feel free to tag us at @CodeMonkeySTU! We will gladly share and retweet. Let your community know about your students’ participation in this international movement. It is something to be very proud of! Parents, family members, and friends would love to know that your students took part in this Computer Science initiative. Be sure to print out a certificate after they complete Hour of Code. Hour of Code, as the name suggests, began as a one-hour introductory lesson in Computer Science, stressing its importance in the 21st century and demonstrating that computer programming is not something to fear, but on the contrary, can easily become second nature. Today, Hour of Code has grown from an hour to a week-long, worldwide initiative that promotes computer programming. Many institutions, such as Microsoft, Apple, Amazon and more are behind this initiative. It is not a time where students are learning how to code – it mainly gives them exposure and access to learn coding in a broader context. Today, with all of the available courses, Hour of Code and CSEdWeek show students how fun coding is and open a window for them to see how cool and interactive is can be. Learning how to code benefits kids greatly. It helps nurture a variety of fundamental skills such as creativity, logic, critical thinking and problem solving skills. Through being introduced to coding early on, students can better prepare for the challenges of the 21st Century. As computer usage increasingly saturates society, it’s up to future engineers to innovate and design software to improve quality of life. How can I continue with Computer Science courses after Hour of Code? Yes, definitely! After finishing Hour of Code, you can continue teaching and learning with CodeMonkey’s online platform. CodeMonkey offers fully-guided lesson plans, a CodeMonkey Instructor Course, and a Classroom Dashboard, where you can track student progress and gain access to all of the resources you will need to successfully roll-out CodeMonkey in your classroom.